South of Vietnam in 2 weeks – Always Look Back ! Arriving from Laos, Vietnam is the 6th country of my Asian trip, and I really felt there for the first time in the border between South East Asia and China. Sadly I didn’t have time to visit the whole country (included Hanoi Bay) but I experienced in two weeks a lot of great times with amazing and very different landscapes. We asked to our hotel what was the best to do, and he selected for us the Imperial City, the tomb of Khải Định and the tomb of Tự Đức. You can easily pass 3 hours in the Citadel (UNESCO World Heritage Site), but we made it in 1h30, arriving for the opening! Then we found a taxi and negociated with him to wait for us while we were visiting the tombs. Khải Định Tomb (approx. 20min from the city center) is really impressive but fast to visit (30min). Tự Đức tomb stay in a bigger site and takes around 1 hour to visit everything. It took 15min to arrive from the other tomb, and around 30min to go back to our hotel in the center. 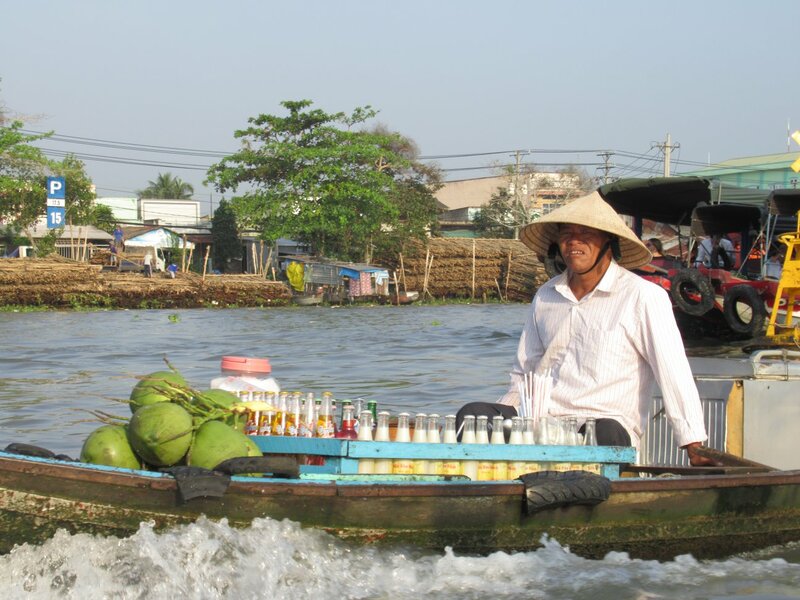 Hué has been a perfect start to visit Vietnam, with a big mix between modernity and tradition. You can find there a walking street by night with a lot of international restaurants and big bars full of lights and music! Taxi to the tombs: 100.000 with return! Hoi An was really close from Hué, we arrived in the afternoon, and the majority of the hotels were full but we found one close by the old city center. We passed our evening there, enjoying like children the beauty of the lanterns. We went out even if it was complicated to find a place open after 10pm, and enjoyed our hangover on the beach the day after! › More pictures on Facebook! We stopped at Dalat just to check the cherrytrees (but already dead mainly), and the Truc Lam Pagoda. 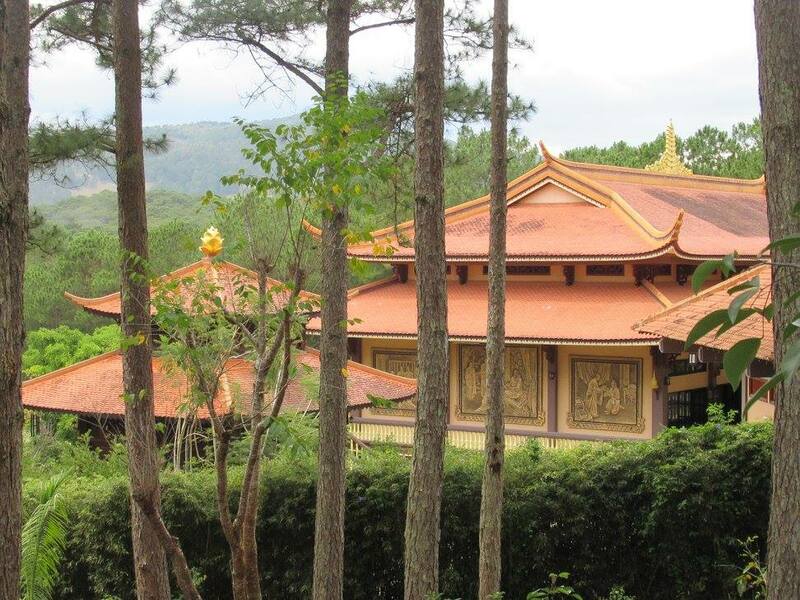 It’s famous for its active monastery, its amazing garden and bonzais, and the view of the forest and lake from the quiet stroll, best way to access on the Pagoda! 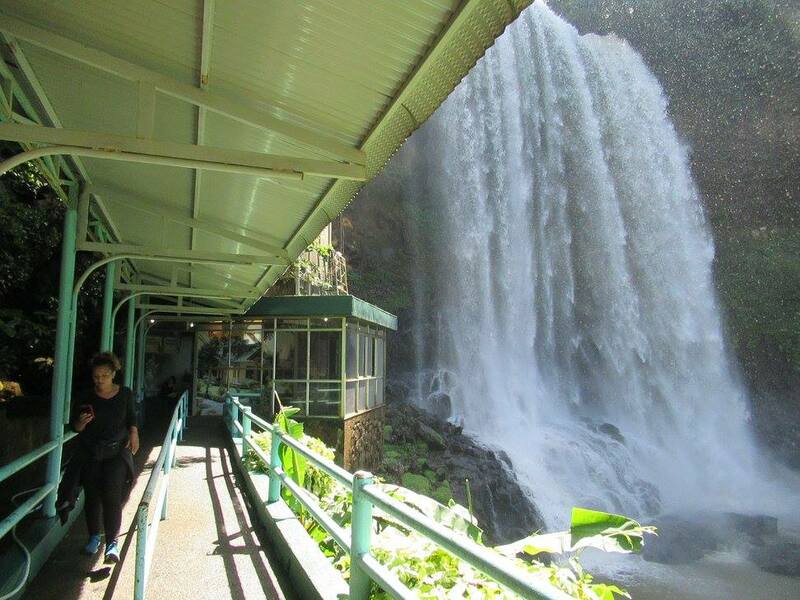 We already visited a lot of amazing waterfalls in Laos, but here is an other level: the entrance include the elevator to the main waterfall, an alpine coaster and a pedalo tour on the lake. We also wanted to check the view on the mountains from Linh Quy Phap An temple, but didn’t have enough time, and we really wanted to go to the beach! 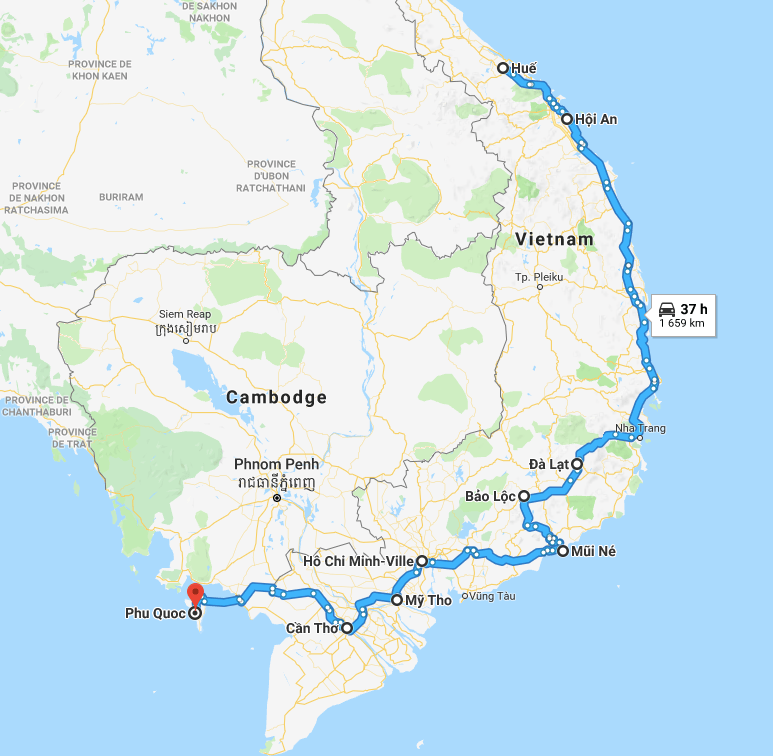 – To Mui Né: 100.000 a van to Phang Thien, then a local bus to Mui Né:15.000/pers + 20.000 for the bag pack! The first day we only enjoyed the beach all along Mui Né, between the city center and the port to enjoy a nice sunset. The second day we rented a scooter to visit the White Dunes and have an amazing tour in Quad. We took rest enjoying a lunch and a nice walk into the fairy stream. You need to go in the end of the road to access to the best part, walking in a small river in a colourful canyon. 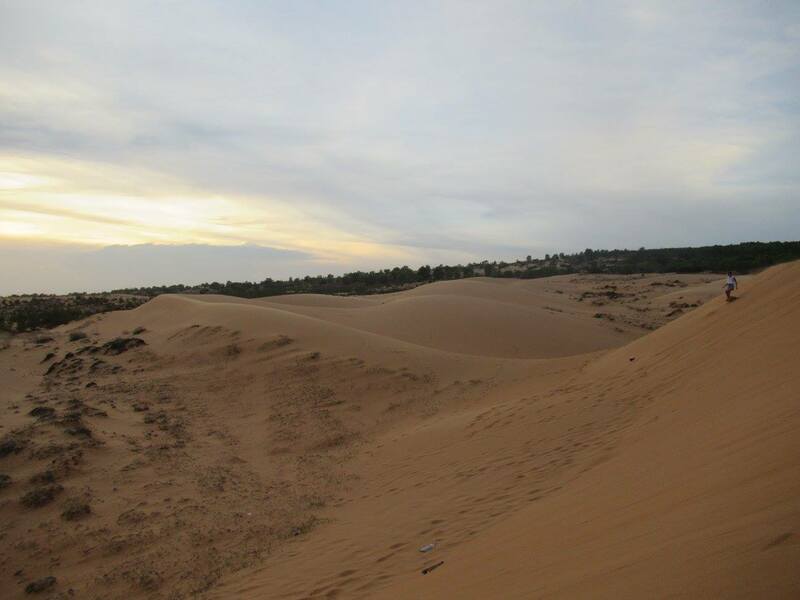 We finished this magic day in the red dunes, to enjoy the sunset (full of tourists). 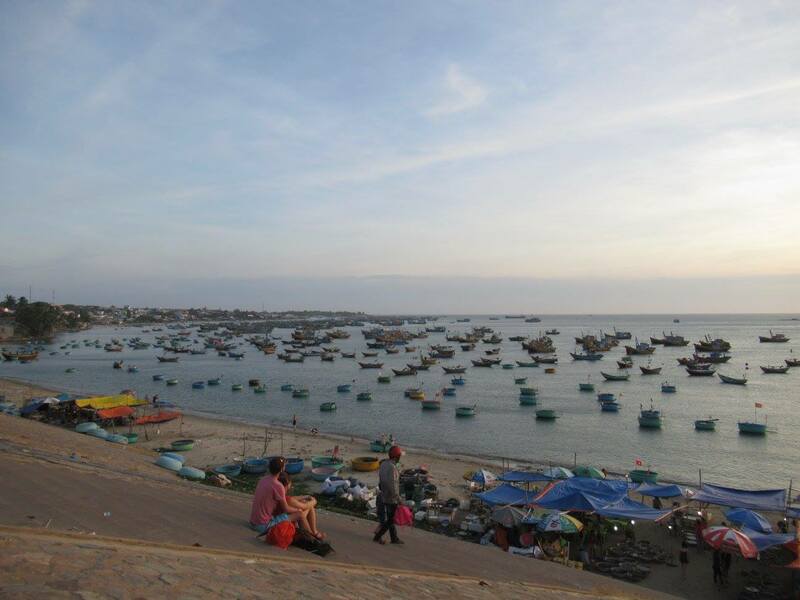 Hotel: Bien Dua, 330.000 a double room with sea view! The capital of Vietnam received us with lights and music all around the streets, at 5am! We found a 24h bar/cafe to wait for our hotel to open. We finished our night we passed in the bus (way to short), and went in District 5, to see the Vietnam loose the final of the asian cup of -23yo! The party this night was equivalent to a World cup celebration. The day after we were anable to do nothing. We just enjoyed the walking street, that’s it. 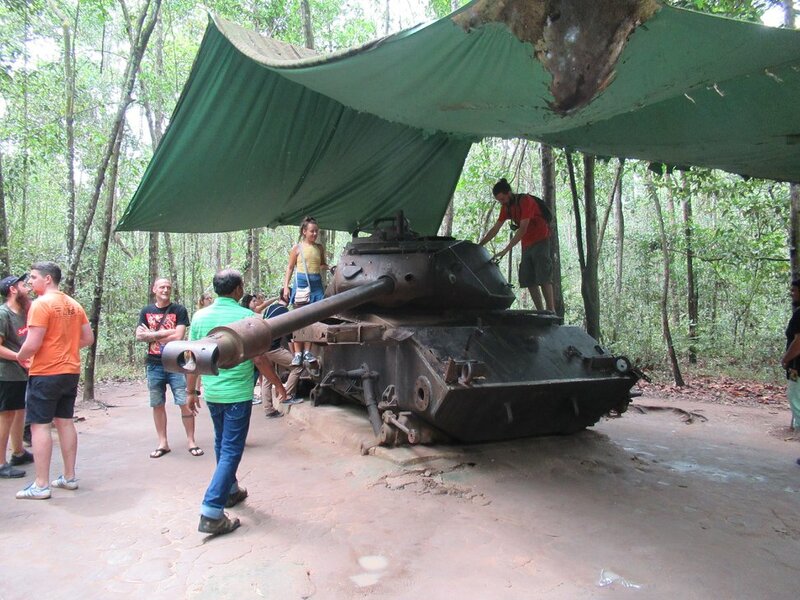 The day after we took a tour to Cu Chi Tunnel, with a friendly guide who explained us every thing you need to know. 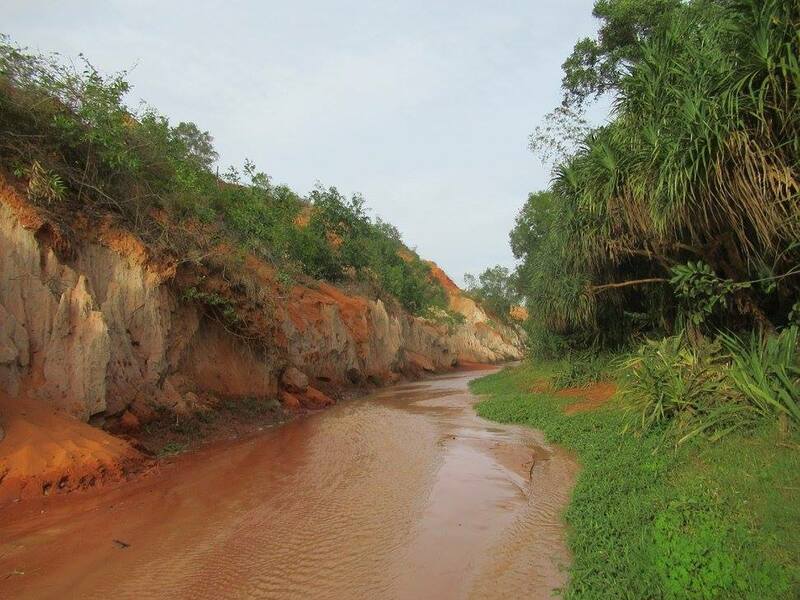 After our Cu Chi tour, we took directly a bus to My Tho to enjoy one last time the Mekong. We found an hotel and walked up early to take a boat before the tourists bus arrivals! At 10am you will cross the first boats. We negociated the price and reduced the price from 750.000 per person (with the transfert to Can Tho included), to 400.000 for 2 people! We did the traditional tour: you arrive on Unicorn island, take a carriage to arrive to a port full of small embarcations. You do a 15 minutes tour inside a canal, enjoying the view on fishermen houses. Then you are welcome in a bee farm to try the honey tea and buy (or not) some homemade sweets, and you finish in a big canal with mangroves. It last 2 hours and really worth it, especially for us to say goodbye to the Mekong we met in Laos! Arrived at midday, we decided to buy ourself a luxurious hotel with swimming pool and rooftop bar, for 35€! We had diner on a nice balcony in front of the floating market pier, with a live show in the street, and walked up early to see the famous floating market. The tours from our hotel and in the pier were expensive, so we decided to go there by ourselves and took a taxi… and a bad direction! We lost time, and we had our bus to Phu Quoc at 8am, so we negociated a 30min tour which left us on the other side of the river, where it’s easy and surely cheaper to take a tour. We found two moto taxi to leave us to the bus station, and took the one of 9am. This one arrive right on time at the Ferry of 1pm (10 minutes more and we would have miss it). 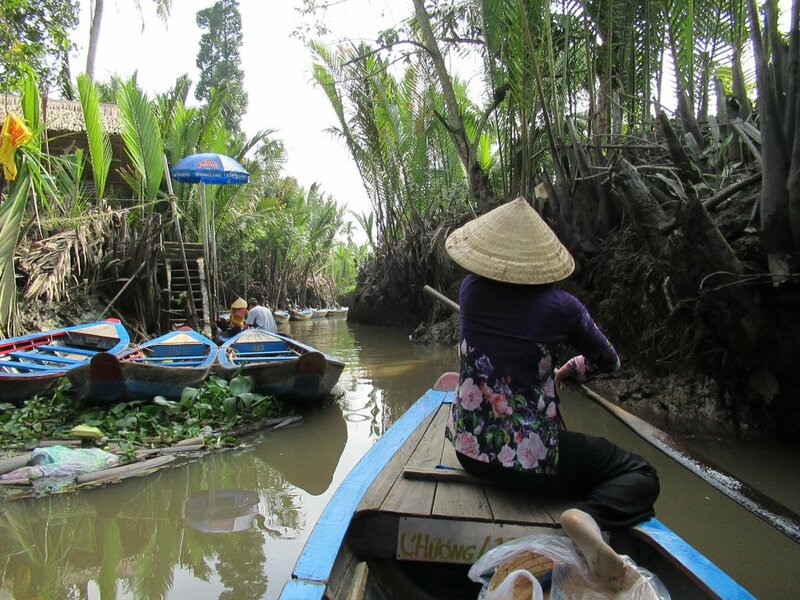 Tip: best way for a cheap tour is to go by taxi (or moto taxi even cheaper) to Cai Rang and pass through a restaurant to get a boat. 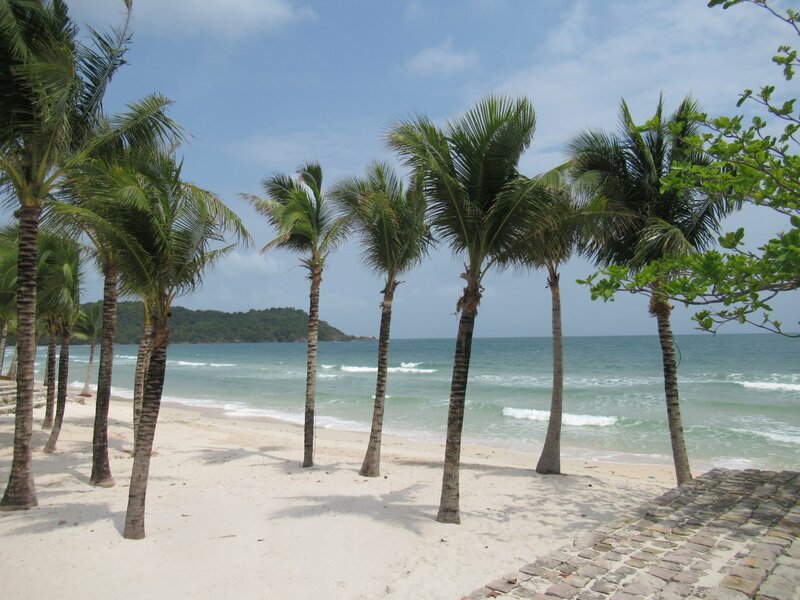 Phu Quoc is known to have one of the most beautiful beaches in the World. Well, it’s right, but the most beautiful and fully cleans are owned by huge resorts where you pay three time the local food prices, and the rooms between 200 and 600$ a night. Well we found a cheap hostel close to the Sky Bar on the main road in the south of the main city. The only way to fully appreciate the island is to rent a scooter. For 2 days we had a nice Honda one, but you can find Yamahas cheaper I guess. First we visited the North, and found a nice resort where we had lunch but also where the deck chair were booked by the clients of the hotel (160$ per night, I can understand). So we’ve been a bit further on the right and found a bar where you can enjoy a fresh juice on their deck chair all day (they also have food, and a swimming pool you can maybe use, if the transparent and warm sea is too salty for you…). We’ve been to the north were we heard there was a nice sunset, but we couldn’t see the sun, so we went to a very new and very high level hotel! Same way: “where is the restaurant please?” And you land on a bar with fires around you, an amazing swimming pool, a bar with foot on the white sand, peace and happyness. The second day we tryed our famous restaurant technic, but this time it didn’t work: to enter to the beach of Marriot resort, you need to buy at the entrance a voucher of 500.000 to use in the bar or restaurant. 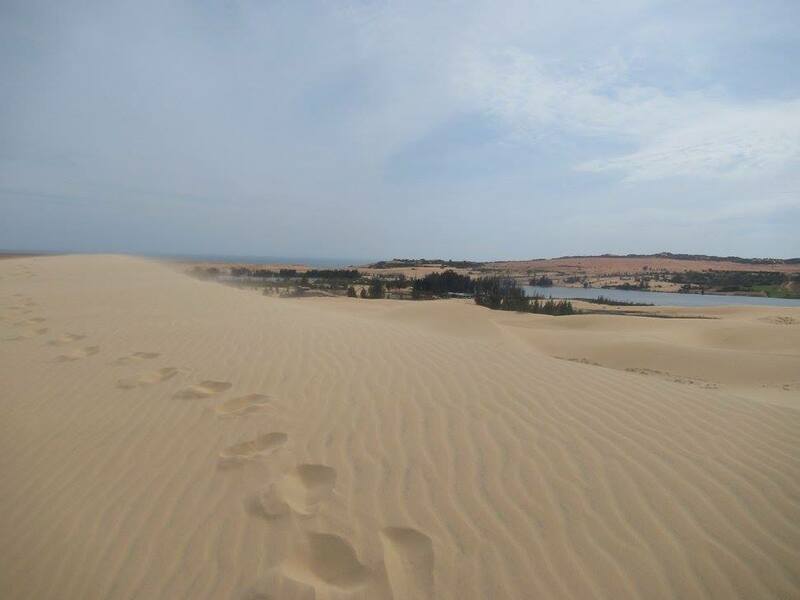 We didn’t want to pay so expensive to do nothing on a beach, so we’ve been a bit further, to Sao beach. We stopped at Coconut prison, a weird and a bit savage demo of the tortures made on communist prisoners… Not for children! There is two side for this Sao beach: on the right the wild part, and cheap deck chairs but a bit of garbage and sand not so so white. And on the left lot of people in different resorts’ restaurants. – First I want to talk about what I heard about vietnamese people: Very friendly! They talk more english than their neighbours, and sometimes even french. – We’ve lost time because of the few buses from Bao Loc to Mui Né… There is a lot of buses from an to Saigon, and I think it’s not really necessary to visit Da Lat and Bao Loc. – Hoi An is really nice, and if you have time I think you should visit the old houses (paying a general ticket).